As it looks the download of the ARToolKit6 SDKs has been taken down. We need to wait for some announcement on what is happening with the project. I have been asked, how do I add ARToolKit6-Android-SDK into an existing Android Studio project or how do I create a new Android Studio project from scratch and integrate ARToolKit6-Android-SDK. What I would like to show you in this article is how to do exactly that. We are not going to extend the existing ARToolKit6 for Android example (ARTrackingExample) but create a new project with Android Studio and add ARToolKit6 to that Android project. And we are going to do that on Windows. 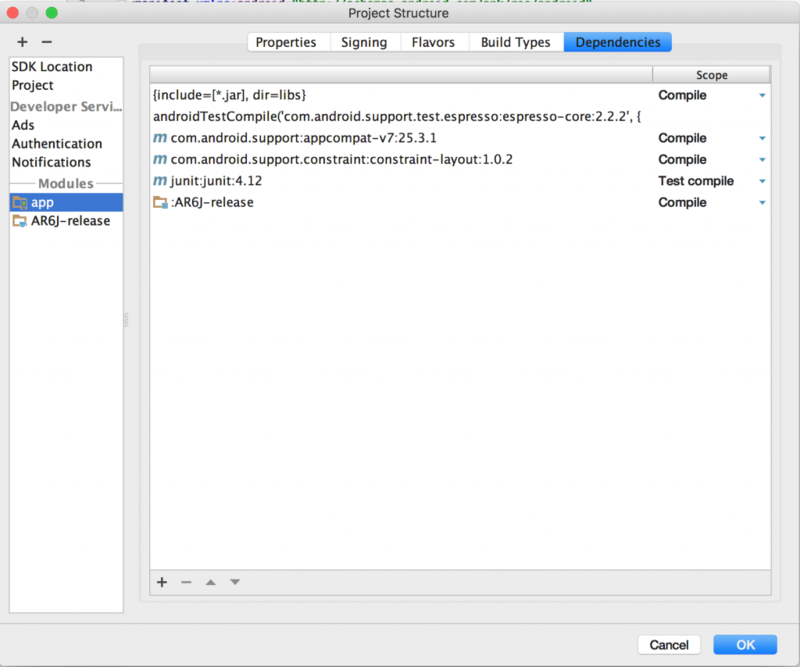 Actually, it is very easy to get ARToolKit6-Android-SDK integrated into an existing Android Studio project. There seems to be an issue with Android Studio reloading imported modules. That is why you need to close and open it again. Now you can use ARToolKit6-Android-SDK inside your Android Studio project. Look at the ARTrackingExample to see how the camera surface rendering is done in principle. Let me know if that works for you and post any questions as comments below. Thanks Thorsten, your example code was very useful as a starting point. I’m beginner to Android and GLES20 so next step is to understand how to draw something else than a cube. For the moment my goal is to draw a rectangular picture. Best regards. Yes, that is quite tricky. That can all be achieved using OpenGL but I believe that would be rather complicated and there should be some frameworks around to do that for us. Having said that as ARToolKit6 has no support for OpenSceneGraph anymore the only fast way to do this would be using the Unity3D plugin. Other than that it would be really good to have a native Android 3D engine and integrate that with ARToolKit. I’ve done as the video tells me to do. From here, how do I be able to use ARtoolkits in the other projects? Are there any instructions to do that so? Also, if I implement the project, the camera pops up and there is no sign of any AR..
[error] ARController::androidVideoPush2: ARVideoSource is not running. [error] Error performing CURL operation: Error (7). Failed to connect to calibration.artoolkit.org port 443: Connection refused. [error] Error -4 returned from cparamSearch. error log message is like this, any clue to solve this problem? Hi Rafael, can you create a stack trace? I think the problem is missing the camera permission !!! Found out the problem !! On class …TrackRender on the configureARScene method is returning false and the last return should be true. Thanks for a nice tutorial, i have question can we place 3d objects, like .obj file instead of creating cubes?